This past Friday evening I caught our own Joe Fox running PanAm's "POED" (Portland to East Deerfield) run, as he passed through Andover, MA. 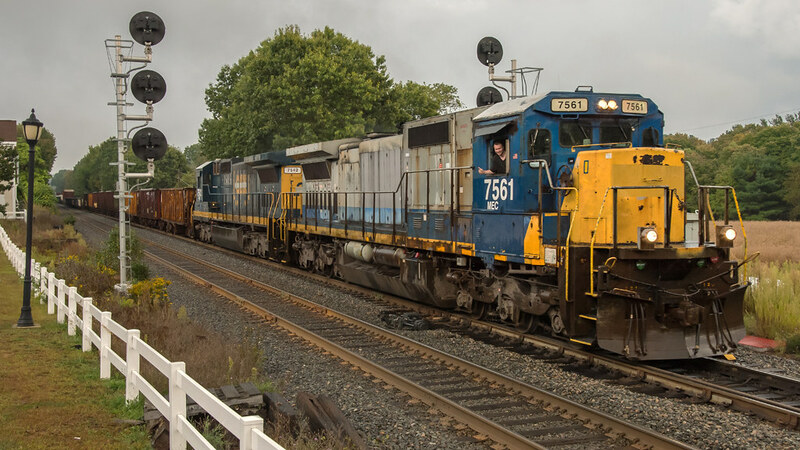 At 7,800 feet long, Joe was already at Lowell Junction when the end of his train passed by me! 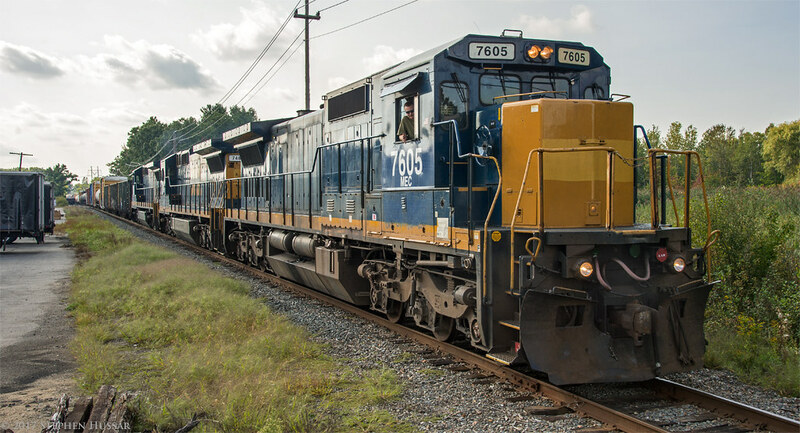 Powered by 2 4,000 HP former CSX GE C40-8's. WOW, love it. Great to see Joe in his regular work environment. Thanks Stephen. In April of 2005, I had to do a community service project for school, and decided what better place than the WW&F, which my family and I had ridden at least 4 times prior. So in doing so I met Dana, James, Jason, Zack, Dwight, and many others. Of course we already knew Fred from past visits as he was our conductor or brakeman many times. After a long 10 hour day of track work, we continued to come back every few weeks through out the years. After High School in 2008, I took another step towards my dream and got a job at Conway Scenic with the help of experience I already had from the WW&F, only to find out later that the OM and our current CMO knew each other was a big help I am sure. I did track work, conductor, fireman and engineer up there until the fall of 2012. During the summer my path would soon take one more serious leap towards my career of choice. By September 2012, after passing pre hire tesring, I began my career with Pan Am. Leaving many friemds behind was hard, but this was what I wanted to do. Starting off as a conductor trainee, then moving up to brakeman and conductor. Seeing many neat places and learning a lot of new stuff. In 2014, I was then promoted to Engineer, and after completing the required tests, have now traversed about 80% of the system. All of this was done with the help of the guys at the museum, and Conway Scenic. I am still very much a part of the museum, as time and work permits, and none the less have not forgotten where my story began. Stephen and Joe. What a great post! Thank you so much. Goes to show you that some dreams come true. It iooks like your WW&F experience helped you at Conway and subsequently at Pan Am and I know all your experiences have helped the WW&F. That they have. Thank you to the good track guys I had a chance to work with at Conway, that knowledge has now carried over. Its nice to share experiences with others as well as knowledge. Every day we learn something new, and I am pleased to be able to continue to use most of the things I learned years ago on a weekly basis in some form or another. 7800 feet is an awful lot of train. I can't imagine being at Alna Center and having the last car in my train at Sheepscot. Must be interesting and a challenge, especially on Pan Am's track. I trust you manage to stay a little cleaner than in 9's cab. Here's Joe making the return trip on Saturday afternoon with more power and an even longer train (110 cars). Photo taken at Shawsheen St., Andover, MA. The internet says this C40-8 was built in July of 1990...99 years newer than WW&F No 9, which Joe was running the very next day. I love that. Don't forget this is also his night job (sometimes). Those ex-CSX engines are probably better/more reliable power than he's used to. Those ex-CSX engines are probably better/more reliable power than he's used to. Joe, you're living a dream I've had for as long as I can remember. Enjoy and please share your experiences and stories with us from time to time. I really enjoyed reading this thread - Joe you will have to write a book on your experiences someday.